what’s in your heart than with heart-themed food? Create a fun and healthy treat with fruit kabobs. Slice fruit into ½-in. slices. 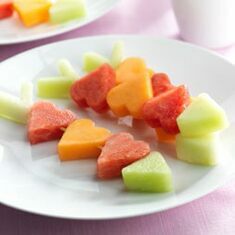 Cut cantaloupe and watermelon with the heart-shape Fruit & Cheese Cutter. Cut half of honeydew slices with the triangle-shape Fruit & Cheese Cutter. Cut remaining honeydew slices into a V-shape using Petite Paring Knife. Starting with V-shape honeydew, thread bamboo skewer through center of "v". Skewer through the sides of the heart, alternating cantaloupe and watermelon hearts. Skewer broad-end of triangle honeydew melon. Repeat with remaining skewers. Tip: Replace some of the fruit with cheese. Cut cheese into ¼-in. slices; use Fruit & Cheese Cutter to cut the same shapes. Put a heartfelt twist on a comfort food classic. 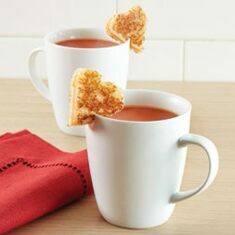 Tomato Soup with Grilled Cheese Hearts is perfect for the whole family or a cozy, stay-in dinner for two. The Square Griddle provides even heat distribution for a golden brown grilled cheese. 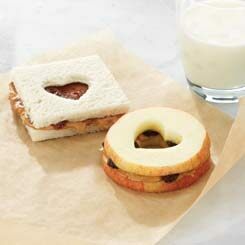 Cut four hearts from a sandwich with the heart-shape Fruit & Cheese Cutter. Make a small slit on the side of the heart and slide it onto the rim of a mug of warm tomato soup. Makes 4 servings. 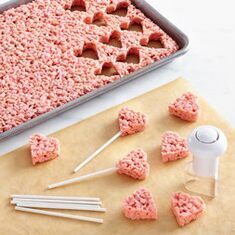 The heart-shape Fruit & Cheese Cutter transforms easy crispy cereal treats into adorable heart pops. Add a little red food coloring to the marshmallows when making your basic crispy treats and stir until you get the desired pink color. 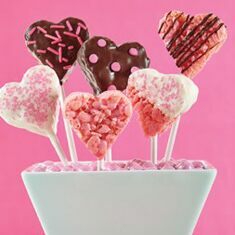 Let the treats cool 10 minutes, cut out the hearts (about 35) and insert a lollipop stick in each. 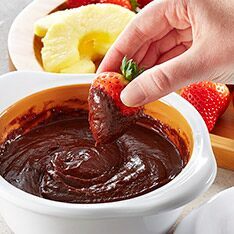 Dip in melted chocolate and decorate as you wish. Stir 1 tsp oil with each chocolate in two separate bowls. Microwave each chocolate, uncovered, on HIGH 1 minute, stirring every 20 seconds or until mostly melted. Dip hearts in desired chocolate or use Decorator Bottle Set to create decorative designs. 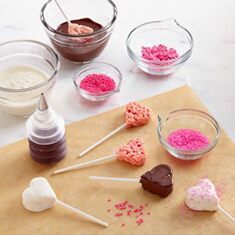 Sprinkle dipped hearts with sprinkles or colored sugar crystals. Allow chocolate to set at room temperature before serving. Makes 35 pops. 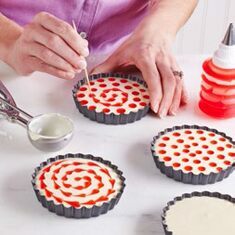 Try this decorating idea with any cheesecake recipe: Pipe small strawberry glaze dots onto the still wet cheesecake in a swirl pattern. Then run a toothpick through the center of each dot to create a string of hearts. 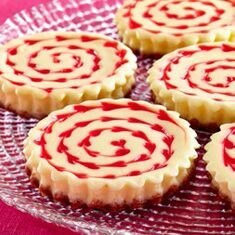 Check out this cheesecake recipe worth trying with our Mini Tart Pans. Preheat oven to 350°F. Arrange six Mini Tart Pans on Large Sheet Pan. For crust, process graham crackers in Manual Food Processor until finely crushed. Add butter and sugar; process until well combined. Using Medium Scoop, place one level scoop of crumb mixture into each tart pan; press crumb mixture into bottom. Bake 8 minutes; remove pan from oven. Meanwhile, whisk cream cheese until smooth. Then whisk in sugar and flour until well combined. Add whole egg, egg white, sour cream and vanilla; whisk until smooth. Using Large Scoop, place 2 scoops of batter into each crust. Bake 20-23 minutes or until centers are almost set; remove from oven. Cool to room temperature; cover and refrigerate 3 hours. Carefully remove from tart pans. Inflate eight 5.-in. (13-cm) balloons to measure 11-in. (28-cm) around widest part. Line Large Sheet Pan with parchment paper. Place 8 oz. chopped bittersweet chocolate into clean, dry Small Micro-Cooker®. Microwave, uncovered, on HIGH 1-2 minutes or until mostly melted, stirring every 30 seconds; stir until smooth. Place 4 oz. chopped white chocolate in (2-cup/500-mL) Prep Bowl. Microwave as directed above. Drizzle some of the white chocolate into bittersweet chocolate. 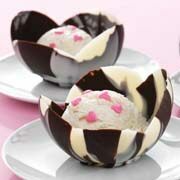 Dip bottom end of one balloon into chocolate and tilt in a north-south-east-west pattern to form four "petals." Place on sheet pan; hold in place until balloon can stand upright. Repeat with remaining balloons, adding white chocolate as necessary. Freeze 15 minutes. Carefully puncture balloons at knotted end using pin. Slowly release air; remove balloons. Fill with ice cream, pudding, or as desired. Creative Cutters aren’t just for dessert. 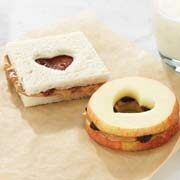 You can also use the heart-shaped cutter to core ¼–in crosswise slices of apple or make cutouts in bread slices. Spread on peanut butter, jelly, raisins, chocolate chips — anything yummy. Remember to brush apple “sandwiches” with lemon-lime soda to keep the apple slices from browning. Everyone knows the way to the heart is through the stomach — whipping up these quick and easy appetizers should do the trick. Whether you’re an edge–of–the–pan brownie lover or all about the ooey–gooey centers, everyone will love this. Bake an 18.3–oz package of brownies in the Brownie Pan. 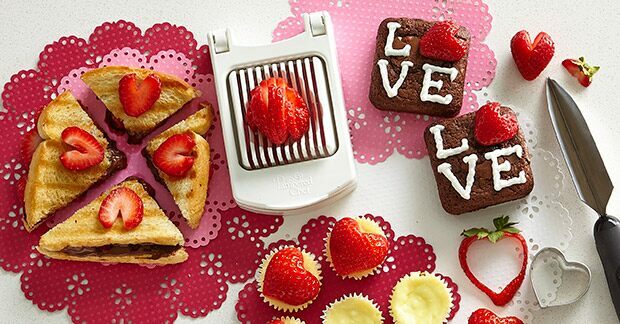 Let them cool and cut out the centers of each with the heart-shaped Creative Cutter. Sweet Thought: Top these treats with ice cream or whipped cream. Or let guests get creative with canned frosting, melted chocolate, heart-shaped sprinkles or colored sugar. 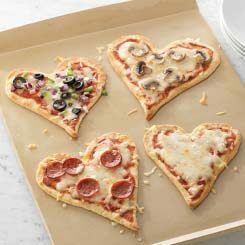 Not to be cheesy, but nothing says love like mini heart-shaped pizzas. Lightly brush a Stoneware Cookie Sheet with canola oil. 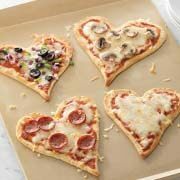 Divide refrigerated pizza dough into quarters and shape into hearts. Bake in a 425°F preheated oven 12–15 minutes or until golden brown, then top pizza(s) with whatever you love. Bake for 2–3 minutes or until cheese melts. 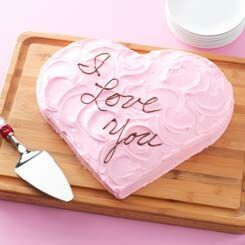 Add red or pink food coloring to the cake batter before baking or frost the cake with red or pink-tinted frosting. Then, top with raspberries or sliced strawberries for a sweet garnish. Impress your sweetheart with candied flowers. Just wash edible flowers in cold water, place on paper towels and air-dry or gently blot dry. Then, brush an egg white lightly onto flower with the Chef's Silicone Basting Brush. Sprinkle flowers evenly with sugar and shake gently to remove any excess. Place them on the Stackable Cooling Rack to dry at least 30 minutes, then decorate your cake! 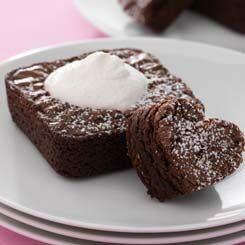 For a truly delicious Valentine’s Day dessert, use red velvet cake mix and frost with canned cream cheese frosting. 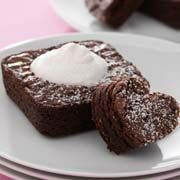 Once the cake is frosted, sprinkle with heart-shaped sprinkles or red colored sugar. Make a Heart: Notch the top of a small strawberry with the V-Shaped Cutter. It creates a heart shape and removes the stem at the same time. Prepare 1 (18 – 21 oz) box of fudge brownie mix in the Brownie Pan according to package directions. 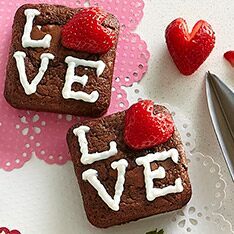 Once cooled, decorate as shown; pipe the lettering using the Decorator Bottle with writing tip and complete the sweet with a strawberry heart. Wear your heart on your sleeve ... er, on a cheesecake. 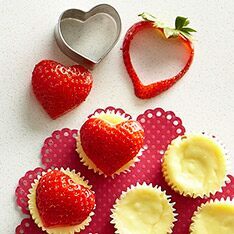 Make a Heart: Cut a strawberry in half lengthwise, then cut a heart shape out of each half using the heart Creative Cutter. Place paper liners in the Deluxe Mini-Muffin Pan, then push a vanilla wafer cookie into the bottom of each liner. Mix 1 (8 oz) package of cream cheese, ¼ cup sugar, ¼ tsp vanilla, 1 egg and ⅓ cup sour cream. Top the cookies with the mixture using the Small Scoop. Bake 18 – 20 minutes at 325°F, cool completely in the pan, remove and refrigerate at least 1 hour. Top with a strawberry heart for a lovely finish. Grill up these sweet sandwiches for your favorite person. They pack lots of love in each bite! Make a Heart: Notch the top of a large strawberry with the V-Shaped Cutter, then cut it into slices with the Egg Slicer Plus. 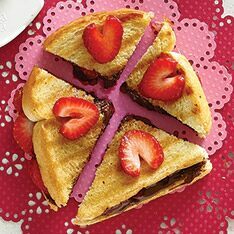 Butter the outsides of two slices of bread, spread the insides with chocolate hazelnut spread and add thin slices of strawberry hearts. Cook in the Grill Pan over medium heat 2 – 3 minutes per side. Top with more strawberry hearts and Valentine’s Day dessert is done! Here’s a perfect “just the two of us” dessert! Combine 1 package (8 oz) of cream cheese, 2 tbsp powdered sugar and 1 cup semi-sweet chocolate morsels in the Garlic & Brie Baker. Microwave, covered, on HIGH 1½ – 2 minutes, using the Mini Mix ’N Scraper® to stir every 30 seconds. Dip with strawberries, pound cake, marshmallows, pretzels, potato chips … whatever your heart desires! “A rose is a rose is a rose” ... unless it’s a strawberry! A bouquet of these beautiful blossoms will make it the sweetest-ever Valentine’s Day. And since love shouldn’t be complicated, making these shouldn’t be, either! Simply hull a strawberry and stand it up on the stem end. Using a Quikut Paring Knife, make four vertical cuts down the sides to create outer petals and peel back slightly. 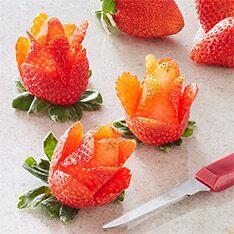 Make four additional vertical cuts towards the center of the strawberry to create the inside petals, then peel those back slightly. 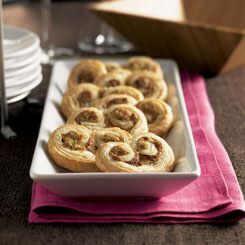 This classic snack is sweet and comforting, just like a good spouse! Cut jumbo or “campfire” marshmallows in half with a Color Coated Bread Knife. 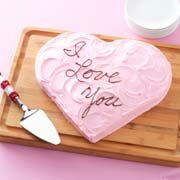 Place the marshmallow cut-side down on a cutting board then cut out a heart with heart-shaped Creative Cutter. Dip the cutter in warm water in between cuts. 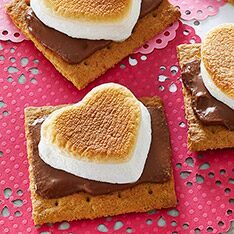 Assemble your s’mores on a Sheet Pan (graham cracker square + chocolate square + 1 marshmallow heart) then pop in the oven under a low broiler 1½ – 2½ minutes or until lightly browned.